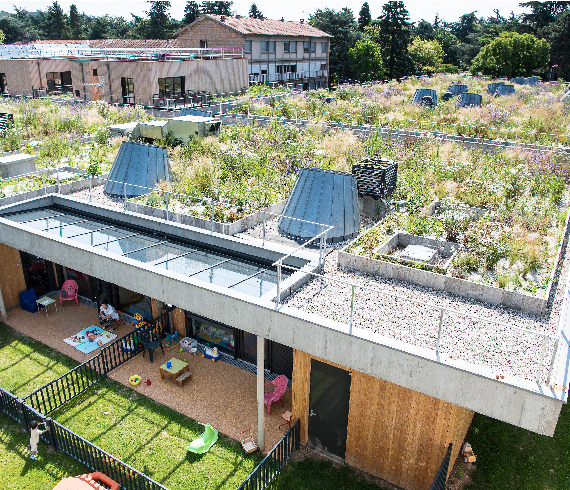 In order to reduce the need for air conditioning, Lyon is promoting the creation of green roofs across the city able improve the natural insulation of buildings. If you spread the leaves of a single plane tree on the ground, they would cover the same area as ten football pitches. No wonder these trees make such good parasols, lined with a natural layer of moisture thanks to the humidity kept up by the vegetation itself. These natural attributes form the basis for why the city of Lyon has included in its PLU – Local Urban Planning – a 30% greening quota, which applies to all new constructions and buildings. This is a first in France. Around half of this will result in the planting and cultivation of large trees in open ground, creating a green canopy over the city. “We need to make wooded areas in the same way that we think about making square meters of flooring,” explains Alain Marguerit, the town landscape planner associated with many urban projects being rolled out across Lyon. One of the aims of the initiative is to bring down the temperature of the city using a natural air conditioning system. Ensuring there are three levels of vegetation helps to create this effect : ground-level grasses, chest or eye-level shrubs, and then foliage cover. Air and water exchanges taking place between the three levels produce a cooling cycle. “We can gain up to 10°C of perceptible comfort, without this necessarily registering on a thermometer,” explains Karine Lapray, co-manager of the Tribu research office; an agency that advises Greater Lyon in recognising and diagnosing the ‘urban heat island’ effect. The Metropolis of Lyon has also established a Climate Observatory, and has mapped the ‘red zones’ in the city with the aim of diagnosing spikes in temperature. New architectural models are being tried out in the Confluence area of Lyon – with better ventilation, ‘cold’ surfaces and greening solutions – to give us a window into the future of the ecological city. Around 150 hectares of industrial brownfield is being restored and has become a laboratory for compact and well-managed systems that could enrich the whole of the surrounding urban area. One of the first techniques to be tested is the presence of porous soils that allow water to seep through channels and replenish the soil reserves. The incentive to create green roofs across the city has less to do with the ‘spraying mist’ or cooling effect, and more to do with improving the natural insulation of buildings. By reducing the need for air conditioning and by deflecting less heat onto public spaces, green roofs help to create a virtuous cycle. For those rooting for a greener city, the ban on building new, detached underground parking lots in the Confluence area comes as another piece of good news. Instead, the city is testing a shared parking lot system, where residents and businesses share around 800 parking spaces, using them at different times of the day or night. There is also talk of using the water from the mining of underground parking lots (pumped over a long period of time and unfit to return to the Rhône) to source ornamental ponds.